Inaccuracies in journalism are of increasing concern to me, as is the idea that so many consumers of communication media fail to use their critical thinking skills, and, rather, believe a sensational report without checking facts. Journalists can easily fuel people’s worst fears, feeding an “us vs. them” mentality. I spoke about this in my recent Charlie Hebdo post. If we are to create a world for ourselves in which we respect, understand, and value one another, one in which we are able to cooperate in sustainable ways, we need accurate and thorough information on which to base decisions. We need to be able to discern “gray” areas, and think things through from different perspectives. On a slightly divergent thought track, I occasionally marvel at how powerful the visual arts, comedy, movies, and performances are in generating a paradigm shift in the general population—the sort of paradigm shift that is needed if we are to develop intercultural competence. I feel that news media should help us think things through by gathering facts, but all too often, it is the arts that help inspire us to do so. Recently, a post crossed my desk that brings these two ideas together for me in a salient way. One of our Cultural Detective series’ authors—Basma Ibrahim DeVries—shared a link on Facebook to a story that resulted in truth telling. A major news outlet was forced to admit its multiple errors and publicly apologize for their inaccuracies, perhaps, in part, stimulated by a French television comedy show—Le Petit Journal! Fox News interviewed someone who presented as fact that there are “no-go zones” in Europe—places in which Islamic law supersedes local law and non-Muslims fear to go. “No-go zones,” viewers were told, included the entire city of Birmingham, England and a half-dozen key areas of Paris. Fox also made various other claims, which met with widespread criticism from the likes of British Prime Minister David Cameron, and the threat of a lawsuit from the Mayor of Paris, Anne Hidalgo. Le Petit Journal was quick to offer its humorous and yet informative rebuttal. Below is a clip of the show, in French with English subtitles. I live in Mexico, and over the past five years I’ve experienced the negative impact that sensationalism and inaccurate, biased reporting can have on a country and its people.Often, this media bias is not confronted. In this instance, however, Fox actually issued four separate apologies in one day for portraying Muslims in a negative light. “Fox News took time out of four broadcasts on Saturday to apologize for four separate instances of incorrect information that portrayed Muslims in a negative light. 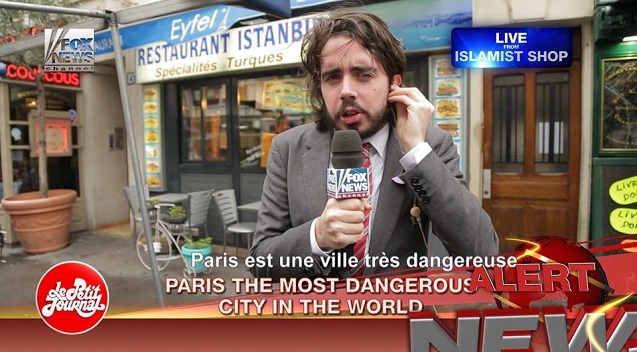 Once Fox News apologized, our French comedy show, Le Petit Journal, had to gloat, of course. They lampooned Fox with great gusto while munching on super-sized popcorn and soda. Click on the link to view the video. I am happy to hear that Fox News was forced to apologize for their biased and false “reporting.” I am grateful to know that the public expression of outrage and humor can still have some effect, however fleeting it might be. If, like me, you’d like to read more about the poll Fox cited, that one in six French citizens support ISIS, you might reference a much more insightful piece about it, published by the Washington Post. The Cultural Detective Method helps people separate facts—what people see and hear—from interpretations, or what the facts mean to a person observing them. Our values influence how we interpret the facts—the meaning we give to the situation. Given personal and cultural differences, the facts may mean different things to different people. This is normal and to be expected. However, what we want from journalists is, to the best of their ability, the specific details and essential data necessary for us to understand a situation more accurately and thoroughly. Situations these days are often complex rather than clear-cut. Reporting on complex realities is difficult in the best of circumstances, and we applaud those ethical journalists who work to make it happen. Thank you for accompanying us on this journey to build intercultural competence. Together, we can build international understanding, respect, and justice. This entry was posted in Commentary and tagged bias in the media, biased reporting, Cross-cultural communication, Cultural Detective, current events from an intercultural perspective, diversity and inclusion, FOX News, global business effectiveness, global diversity, Intercultural Communication, intercultural competence, Le Petit Journal, multicultural society, no-go zones, sensationalism, stereotypes by Dianne Hofner Saphiere. Bookmark the permalink.